First I want to say thanks for a great service which I've used for many years- great work! My question is about conditions: I know how to use them, but would like some advice if at all possible. If they do not match up, the user (and admin) should receive a specific notification saying that the application was unsuccessful. If they do match up, the user should be redirected to fill in the rest of the form and submit the complete application, after which they should receive an auto responder email with a 'successful application notice, while the admins should receive the actual submission. Please help me to understand the process, or perhaps shed some light on implementing this efficiently, as always I really appreciate your feedback and assistance. Thanks in advance to anyone willing to help!!! A two-form set up will probably work best for your idea. The first form will contain the 'qualifying criteria' questions, while the second form will have everything else. 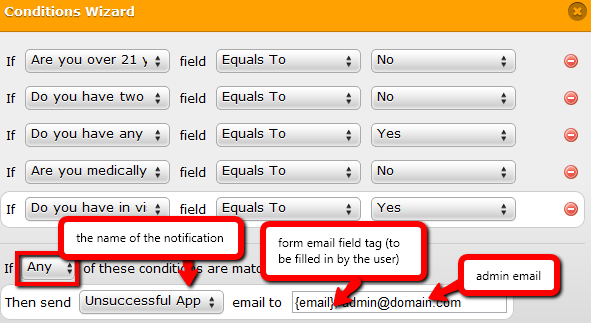 Your second form will need to have an autoresponder and notification set up. 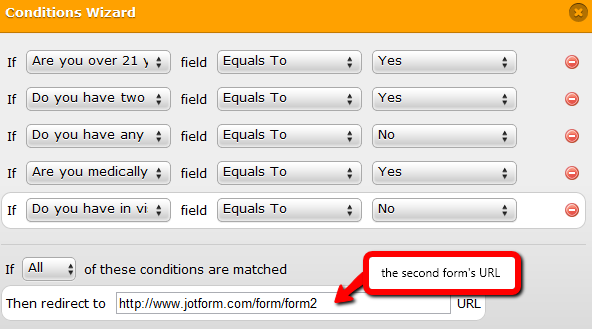 If your first form has fields such as name and e-mail, we can easily pass these values to the second form (in case the applicant qualifies) by appending tags onto the second form's URL. I will help you deal with this when you are finished setting up your forms. Genius. Thank You. I'll be working on this, and will let you know.